It all started with the pioneers. We were going on a Pioneer Trek to Martin's Cove with our ward - me as one of the dignified and responsible leaders - and we were required to wear authentic pioneer clothing. Well, you know, as much as possible. I like to think I know my way around a sewing machine, so I decided to make my skirt. All us girls had planned to make our skirts in the first place, but after our embarrassing attempt at helping the young women mass produce their skirts in an hour and a half - the skirts ended up so narrow that they could only get around by hopping - most of the girls resorted to visiting the local cowboy apparel store. I was not to be deterred however, and went out and bought myself a pattern. A pretty little tiered skirt that was sure to be cute and versatile. The skirt on the model in the picture on the pattern envelope was ill fitting and unbecoming, but did that bother me? No! I just chose one of the other styles that were included with the pattern. It really was just what had in mind. The material was 40% off, and I paid a grand total of $28.37; more than I had planned, but I was gong to be really happy with this skirt, so it was worth it. 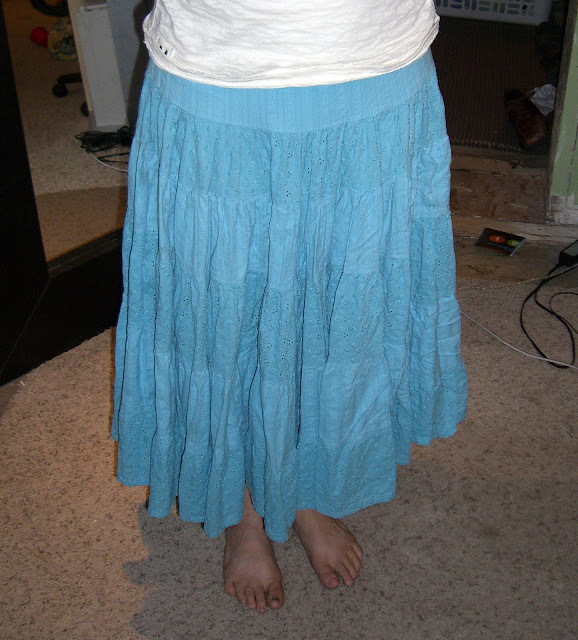 Half a skirt later it became all too apparent that the skirt wasn't right at all. I would probably still be able to wear it on the Trek, but forget about being authentic. And there was just so much of it. I had only added four of the seven tiers, and it was already so voluminous as to be a little difficult to handle. 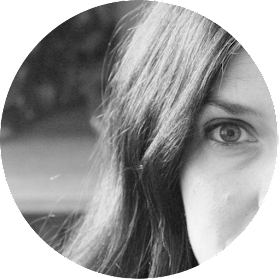 (We started making jokes about all the things I could hide in my skirt due to its very abundant nature: candy, books, a television, a live chicken.) Not to mention that Richard just didn't like it. I had chosen the style and material specifically so it could be a skirt I would wear more than once. As Richard commented on the sheer mass of material that seemed to be multiplying on our kitchen table, I tried to defend myself. I told him that I had considered making one of the styles that required significantly less material, similar to the one the lady wore on the pattern envelope, but it just looked so bad on her that I couldn't do it. As an afterthought I added, just a little discouraged now, "Though it may not end up looking good anyway." Richard nodded knowingly and said,"Probably not". Of course at this point I was too vested in the project to quit. The pattern wasn't difficult, but it was time consuming, and I just couldn't give up after all the work I had done. And there was part of me that still hoped that the skirt would, somehow, come out just the way I imagined and manage to completely win my husband over at the same time. (Not surprisingly, if I had made it into a mini skirt, he would have liked it just fine.) So I plodded on. In any case, I still needed a skirt for this pioneer trek and the deadline was fast approaching. And then, yards and yards of material later, I was suddenly finished! Finally! In my excitement I held it up and Richard exclaimed, "Oh Good! We won't need to bring our tent!" Here is one I took just before I took off for a quick flight around the neighborhood. So, I am going to have to accept it. Completing this skirt didn't suddenly transform it into the cutest skirt in the land, at least not in Richard's opinion. So what am I to do? I'm just not. . . something enough to wear clothes that my husband hates. Where would I wear them, I ask you? 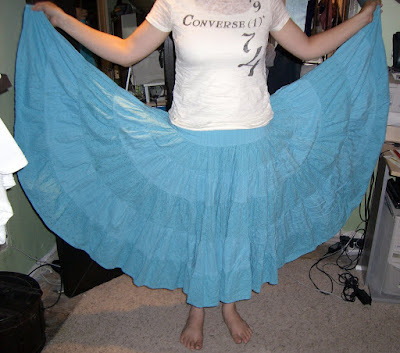 It is a shame though, because when I spin in a circle the skirt billows up around me and I feel like a Spanish Dancer. Which, incidentally, Harrison LOVES. 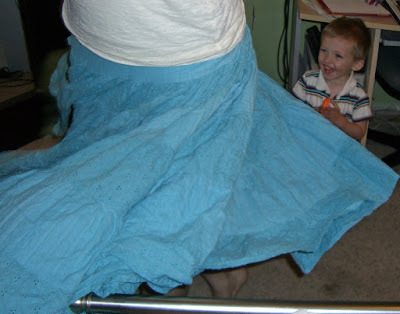 He laughs and claps and runs at me so that the skirt hits him in the face, over and over. Hmm. . . maybe if I hit Richard in the face with it a few times it will change his mind?